Some books change your life. They change the way you see the world. They do this not only with the story as a whole, but sometimes with an idea, a beautiful phrase, or even a word, that resonates with you the way nothing has before. Sensational Quote Sunday is my way of paying homage to those books that remind me every day why I love reading. Last month I revisited Anne of Green Gables, from the eternal L. M. Montgomery. I’m working my way through the whole series again, now, and it’s wonderful. 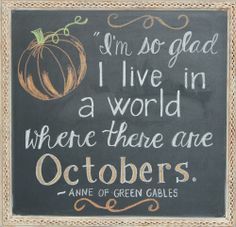 Anne has so many quoteable moments, with her beautiful, whimsical turns of phrase. I have a soft spot for this one, however, because in Australia October means spring – and to me, October means my birthday. It’s an excellent month! Do you have a favourite month? Or a favourite Anne-ism? Mae Holland has just landed her dream job! She’s going to be part of the Circle, the most powerful internet company in history: the first company to let you control social media, banking, emails and anything else you can do online in one place. Their Californian campus is sprawling and decadent, with everything you could ever need available free to employees. Why would they ever want to work anywhere else? In fact, why would they want to leave the campus?